This is the paragraph immediately following the family tree image in "The Corwin Genealogy." Now, this "tree," without a word of explanation more than the names arranged as above, makes Thomas Curwin, the Quaker, Matthias Corwin, of Long Island, and George Curwin, of Salem, three original immigrants, though at different times, to be brothers, and the sons of a John Curwin, of England., Thomas and George may have been brothers, but the remarks already made, and the general tenor of the Introduction, will apparently quite forbid the placing of Matthias here. Probably this arrangement by Rev. George Curwin was a supposition, upon which he was beginning to work out a Curwin Genealogy ; but his death soon after, (1717.) prevented him from either verifying or disproving the same. It seems impossible to allow such a record to overturn all the testimony which the reader will find respecting another origin of Matthias Corwin. We hope, however, that the truth may be elucidated. The writer would simply observe that the family of Matthias Corwin, on Long Island, have never possessed (so far as his knowledge extends) the Curwen Arms, which the family of George, both in the East and in the West, have cherished; that the early generations of these families are not known to have ever visited or even corresponded with each other. The name of Matthias might have become known to Rev. George, from the neighboring Ipswich records where it yet remains. Rev. George was but two years old when his grandfather died. Matthias moved from Ipswich to Long Island about the time of the birth of the first George's children, 1640 ; while Thomas doee not, as far as known, appear in this country till forty or fifty years after the arrivals of George and Matthias. 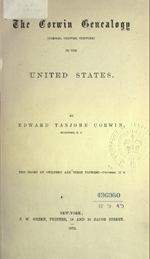 [S18811] The Corwin Genealogy of the United States, pg.viii (p3 of Preface).